My buddy Mike took advantage of my April Portrait Sale to get some personal treasures created featuring himself. I've known Mike for a very long time and we set out to capture his essence and wit in these custom illustrations. I hope everyone in the family agrees they are a solid representation of him. I had a lot of fun (and uncontrollable giggles) drawing these out. 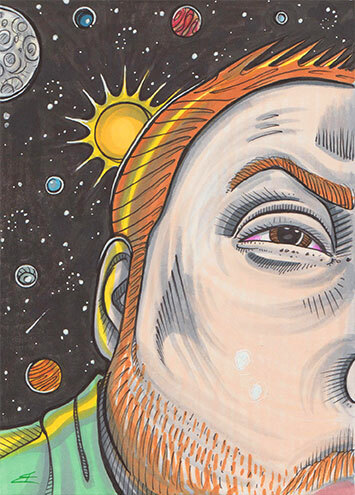 The first commission is Mike's raised eyebrow in space. I feel like the portrait made him larger than life and I almost see him as a sort of Galactus who is set out to devour entire planets. 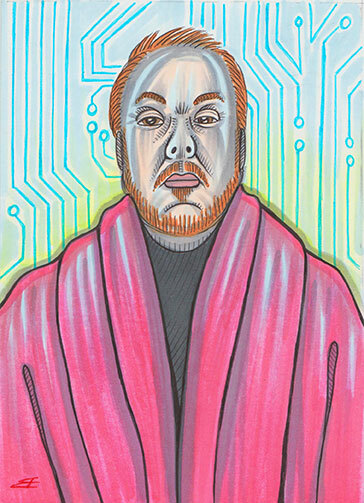 The second portrait is Mike in his favorite pink robe. For this one, he wanted the background to represent the internet so we went with some blue circuitry. I was slightly apprehensive about this element but very please once I had the light blue line work put in. Thanks for the projects Mike! If you are interested in a custom portrait, just email me at dregstudios@gmail.com to discuss pricing and tell me your idea! To see more of my custom portraits, please visit my PORTRAIT PAGE! RIVERS and SPIRES Festival THIS Weekend!